Global Aviation provides aircraft inspection, maintenance and repair services. Global Aviation, an independent aviation service company, recently opened a new 35,000-sq-ft hangar, bringing its capacity to 98,000 sq ft at Hillsboro Airport (HIO) in Oregon. The new hangar offers the additional space needed to accommodate the increasing demand for maintenance, modifications and completions work as well as room for more tenant aircraft. “We had a greater demand for maintenance than space available so we looked at the option of opening a facility on Portland International Airport. After running the numbers it made more sense simply to expand our own operation,” Flo Newton, Global Aviation’s president, told AIN. The company had two adjoining hangars and a parking area separating them from a third hangar. Moving the parking area to an open space north of the Global Aviation complex opened up space between two existing hangars for the construction of the new hangar. “It worked out perfectly because we now have one continuous, interconnected hangar complex that gives us the space we need for both maintenance and tenant storage,” she said. Global Aviation’s eight-acre parcel includes 21,000 sq ft of offices; 98,000 sq ft of hangar space comprising four contiguous hangar bays; and 110,000 sq ft of ramp space. Approximately 34,000 sq ft is dedicated to maintenance, another 4,500 sq ft to back shops, a 1,600-sq-ft parts/shipping and receiving area and 1,300 sq ft of maintenance offices. Newton’s entry into aviation was atypical. “I had been working in the Louisiana Pacific (LP) corporate offices in Portland as an administrative assistant to the CEO,” she said. “The lumber market is cyclical; during the good years we used our corporate aircraft to full capacity, but in the slower years it spent a lot of time on the ground.” Like many companies in the early 1980s, LP recognized that it could offer its corporate fleet for charter to increase utilization and generate revenue. When the company entered the charter business in 1981 she took on charter sales. Fourteen years later the company decided the operation was no longer beneficial. Newton found herself in a unique position: she had a roster of charter customers who now required lift as well as valuable relationships with other charter operators. “The transition was natural for me to begin offering broker services, finding aircraft for customers with whom I had been working.” She started Global Aviation on Oct. 1, 1995, one day after LP closed the charter operation. 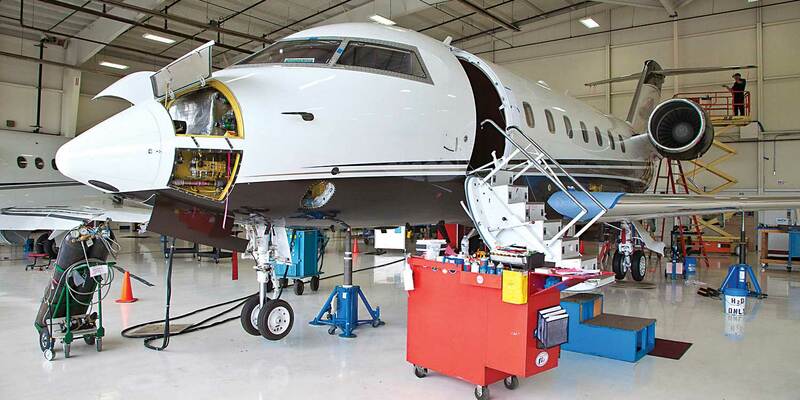 As the business grew, Global Aviation was named a Bombardier authorized service facility for line maintenance. “We’re always looking for new factory authorizations,” Lockhart added. In addition to the Global Express, Challengers and Learjets, the FAA- and EASA-certified repair station can maintain aircraft from most of the other major business jet manufacturers and their associated engines, including the Citation 500/501, 550/551, S550, 560/560XL, 650 and 680; Falcon 2000/2000EX and 900/900EX; Embraer 135/145; Gulfstream Astra/G100, G150, G200, GII, GIII, GIV, GV, G550 and G650; and Hawker 400/400A/400T and 800/800XP. The MRO also holds dealership agreements with Rockwell Collins, Universal Avionics, TrueNorth Avionics and Astronics. In addition to aircraft inspection, maintenance and repair services, Global provides metal polishing of aircraft bright work performed in-house by a 16-member, Safety First-certified line service staff. Global Aviation has 82 employees, including mechanics, pilots, flight attendants, line service technicians, administrative staff and catering chefs. Eighteen are dedicated to maintenance, including 12 A&Ps and three avionics/A&Ps. Global, the CAA FBO for HIO, is a Shell fuel retailer and operates two 5,000-gallon refuelers. The company has a Part 135 charter certificate and provides worldwide transportation with a fleet of eight aircraft, including a Global Express XRS, GV, Challenger 604, Challenger 300, Hawker 900XP, Hawker 800, Learjet 45XR and Learjet 35A. The company provides aircraft management services, maintenance management services and pilot services and provides hangar space for 24 tenant aircraft and overnight hangar space for transient aircraft as well. The company also operates an on-site, gourmet catering kitchen staffed by three full-time chefs.